Elvis In the Beat of the Night: True Stories of Elvis and His Police Buddies by Robert H. Ferguson. The first edition was published in 2007, with a second re-run in 2008. This second edition is an updated and abridged version. The Elvis Cookbook by Michael C. Cooper. Made in Germany - The Complete Private Recordings by Joseph Pirzada. CD/book set. The 4CDs include tracks from personal recordings made by Elvis while stationed in Germany and essential RCA studio masters from 1957-1958. The book discusses Elvis' RCA studio recordings held during 1957-1958. Elvis Presley: Biografía, letra y música by Adolfo Pérez Agustí. Elvis Through the Lens of Phillip Harrington by Pål Granlund. Elvis The King by Laurent Poret. Serving with the King of Rock and Roll: A Simon Vega memoir and tribute to my friend Elvis Presley by Erin Graybill, Cecil Cunningham and Simon Vega. 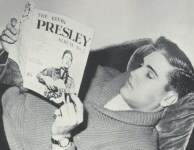 Elvis Presley - Music, Movies, Myth by Matthew Martin. Elvis The Spirit of '76 - Live in Champaign October 1976 by Kieran Davis. Bruce Jackson on the Road with Elvis by Gary Jackson. Elvis 1956 January - February by Paul Bélard. Elvis September 1958 - Germany Bound by Paul Bélard. My Las Vegas - With Elvis, Sinatra, Streisand, Darin, Prima & More by Bobby Morris. The Elvis Files Magazine Issue 27 by Erik Lorentzen. Elvis Now in Person by Erik Lorentzen. 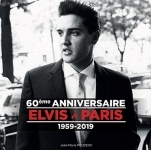 60ème Anniversaire - Elvis à Paris: 1959 - 2019 by Jean-Marie Pouzenc. First published in 1999 with a 2nd edition in 2007. Elvis in Vegas: How the King of Rock 'n' Roll Reinvented the Las Vegas Show by Richard Zoglin. Little Book Of Elvis Presley: Inspirational Quotes From The King Of Rock 'n' Roll by Malcolm Croft. Elvis Through the Ages: Images from the Hollywood Photo Archive by Colin Slater and Boze Hadleigh. 1964: The Year That Changed America & Me by Joe Tunzi. The Definitive Vinyl Artwork of Elvis Presley: 1956 - 1977 (revised and expanded edition) by Joe Tunzi. Walk A Lonely Street by Tony Plews. Twelve Inch from Cover to Vinyl - The Artistry of Elvis Bootlegs. Sequel to Bootleg Elvis - The Vinyl Records: From 1970 to Today, released in 2012, and Seven + Ten Inch from Cover to Vinyl - The Artistry of Elvis Bootlegs, released in 2018. Contains covers of 12" vinyl bootlegs. Teenager's Hero Vol. 2 by Steve Rino. Elvis Sessions IV, The Recorded Music Of Elvis Aron Presley 1953-1977 by Joe Tunzi.